← [Rumour] Will The Samsung S4 Be Unveiled In CES 2013 ? Extending the spirit of giving and generosity into the New Year, Frasers Centrepoint Malls is holding a nation-wide Share to Care Donation Drive, happening at its various malls from now till 22nd February 2013, 10pm. Funds raised will be distributed to social service organisations under Community Chest. “As an organisation which believes in giving back to the community, Frasers Centrepoint Malls is committed to raising awareness and funds for the less fortunate among us. This year, proceeds from our Share to Care donation drive will support the many beneficiaries under Community Chest,” said a Frasers Centrepoint Malls spokesperson. 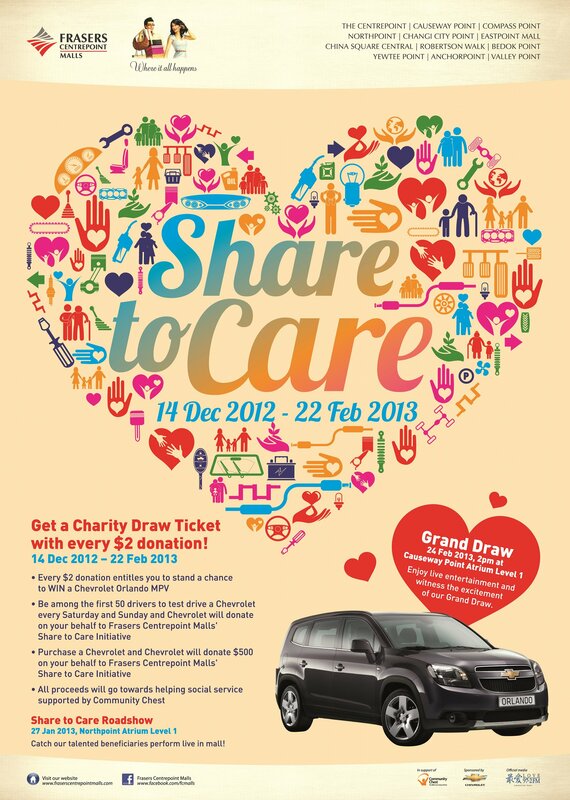 As an incentive, every S$2 donation entitles you to one raffle ticket for the chance to win a Chevrolet Orlando MPV! This means that the more generous you are, the higher the chances of walking away with the prize, worth an estimated S$80,000! Spread the love and joy by heading down to the following Frasers Centrepoint Malls to do your part for the community this New Year! Contributing to the community, Chevrolet will also be donating S$2 on behalf of the first 50 drivers who test-drive a Chevrolet every Saturday and Sunday during the donation period. They will also make a S$500 donation to Frasers Centrepoint Malls’ Share to Care Donation Drive for every Chevrolet purchased during this period.